This course is for the novice user who has little or no experience with Microsoft Excel except for my Excel Beginner Level 1, 2, and 3 courses. 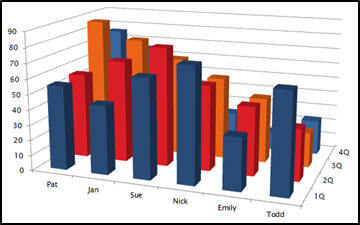 Today's course is mostly about Charts & Graphs. 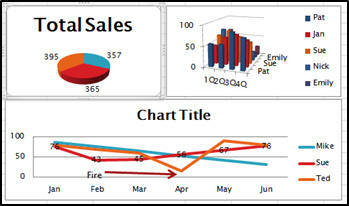 You'll learn how to copy your charts to Microsoft Word to embed them inside of reports or other documents. You'll see how to create a summary sheet (also known as a dashboard). You'll learn how to separate a piece of pie from a pie chart, and create leader lines. Again, this is the perfect class for anyone who is new to Microsoft Excel 2007 and has finished my Excel Beginner Level 1, 2, and 3 courses. If you have little or no experience with spreadsheets, or you just want to get familiar with how Excel 2010 works, this class is for you. on 3/23/2012: Is there any way to use the same chart in more then one sheet without having to make the chart again? 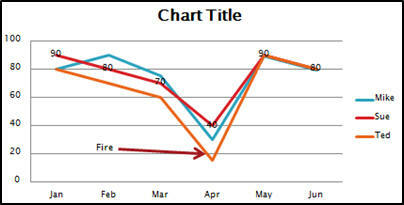 on 3/23/2012: if you move a chart to a new page is it still effected by the theme of the page its data is on? Yes. When you select a THEME, it affects EVERY sheet in the workbook. Changing it affects every worksheet. I'd have to see this in action to tell you what's going wrong. I've never experienced this behavior before. If you want to contact me via the TechHelp page and send me a screen grab of what's going on, I might be able to help. Laurie Jones on 4/11/2013: Just so you are aware, at counter 13:14, Ted, with 92%, should be on the orange part of the pie, not Mike with only 2%. Yep. 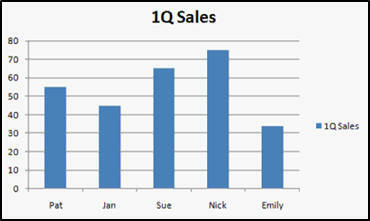 Looks like Excel mangled my chart. I didn't even notice it at the time I was recording it. You can see it at time index 12:40 (13:14 is the total time of the video). Ted got stuck way up top and it looks like Mike is in the big part. Oops. Thanks for bringing this up. 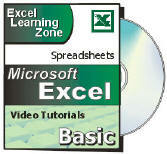 I just tried it and it worked fine for me in Excel 2013. Insert > Table. Then then TABLE TOOLS / DESIGN tab appears. Total Row is one of the checkboxes on that tab. If you click OUTSIDE the table, that option goes away. Remember, the Ribbon is CONTEXT SENSITIVE, so you'll only see options available for the objects that are currently selected / in use. Rajiv Dass on 11/20/2015: Your Pie chart in lesson 5 (13:00) at the end. Your labels do not match the percent on the pie. Mike is 2% with the blue slice of the pie and Ted is 92% which is the color orange of the pie. Sorry, I am not being picky. If all of my teachers taught as you, I would be greater than Einstein! Rajiv Dass on 11/20/2015: I know it is just for illustrative purposes but in lesson 6 of Excel 2010 Beginner 4 (02:42) there are no states abbreviated as "HT & ON". As you say it's just an example, it doesn't need to be accurate. Rajiv Dass on 11/20/2015: Hi Richard, you lost me in lesson 6 Tables (10:18) after inputting record #9 for Michele Jones, row 10 for Total you had "0" automatically and the only way I was able to get the same result was to select the lower right corner and pull it down. at the end of the video after selecting "Total Row" in "Table Tools Design" tab I had a little difficulty in inserting a new record because I did not have the empty row above the "Total Row" row. If it's a list/table pressing tab on the last row should insert a new row. Daniel Re on 7/27/2016: Which axis is Y ? Vertical? LYNDA WAGGONER on 12/27/2016: I too am noticing I don't have all the options in the ribbon that is shown in the video. Don't have a Table Style Options group at all. Do I need to do some customization in my ribbon settings? Which version of Access are you running? Are you on Office 365? What is 2017? The year you have in your spreadsheet or the version of Excel. Depending on how you have constructed your formula it can be used for different years.